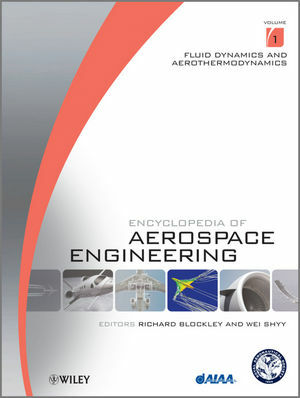 The Encyclopedia of Aerospace Engineering represents a major publishing initiative to establish a high quality, carefully coordinated reference work that will enhance education, training and research in this complex and demanding field. Coverage ranges from core disciplines such as electrical and electronic engineering, mechanical engineering and physics, to advanced materials, digital technology and environmental science, all of which have an ever-increasing, interactive role in modern air and spacecraft design. The Encyclopedia provides an unparalleled exposition of essential scientific concepts and their application to current engineering practice, laying a foundation for further research and study in specialist publications. Extensive and up-to-date cross-referencing enhance the value of this monumental work and will ensure its unique contribution to the engineering literature. The Encyclopedia will be available in print or online. Volume 1: Fluid Dynamics and Aerothermodynamics. Part 1. Perspectives on Aerospace Engineering. Part 2. Fundamentals of Fluid Flows. Part 3. Incompressible Flows and Aerodynamics. Part 4. Compressible Flows – Subsonic to Supersonic. Part 5. Hypersonics and Rarefied Gas Dynamics. Part 6. Heat Transfer and Thermophysics. Part 7. Computational Fluid Dynamics. Part 8. Experimental Techniques for Fluid Dynamics and Thermal Science. Volume 2. Propulsion and Power. Part 14. Aeroelasticity and Aeroservoelasticity. Part 15. Computational Solid Mechanics and Fluid-Structure Interaction. Part 16. Experimental Techniques for Structural Mechanics. Part 17. Structural Health Monitoring (SHM). Part 19. High Temperature Materials. Part 21. Materials for Space Applications. Volume 5. Dynamics and Control. Part 25. Trajectory and Orbital Mechanics. Part 26. Attitude Dynamics and Orbital Control of Spacecraft. Volume 6. Environmental Impact, Manufacturing and Operations. Part 28. Acoustics and Noise. Part 29. Emissions an Atmospheric Impact. Part 30. Disposal and Waste Mitigation. Part 31. Manufacturing, Lean Technologies and Operations Integration. Part 32. Vehicle Configurations and Performance. Part 33. Air Vehicle Design. Part 34. Micro Air Vehicles. Part 35. Space Vehicles and Travel. Part 38. Avionics System Integration. Part 42. Optimization Techniques and Applications. Part 43. Safety Engineering and Mission Assurance. Volume 9. Index and Units.